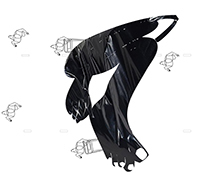 Galeria Vermelho presents Cinzas [Ashes], Dora Longo Bahia’s sixth solo show at the gallery. The main room of Galeria Vermelho will present the installation Cinzas, built on the basis of the ruins of parade floats used in the 2016 Carnival. In the entrance hall, the artist is ceding part of her exhibition to her students, who will set up a printing press atelier in the gallery, producing artworks daily. Taking education as part of her artistic practice, Longo Bahia has been maintaining a rotating study group in her residence since 1999, which currently is called Depois do fim da arte and is made up of students from different colleges and areas, along with young artists. The participants get together to discuss subjects concerning different disciplines such as art, philosophy, politics and architecture, always under Longo Bahia’s orientation. Dora has already included the group of students in various exhibitions, including the 28th Bienal de São Paulo, when she ceded part of her participation to Anarcademia (the group’s former name). The artist is bringing the same group to the exhibition about Avenida Paulista being held by MASP from February 16 through May 28, 2017. There, the group is occupying one of the museum’s auditoriums with a weekly cineclub. Part of the material of the cineclub will be produced by Depois do Fim da Arte in the territory created by them at Galeria Vermelho. For both projects – at Vermelho and MASP – Longo Bahia is sharing the coordination of the group with Renata Pedrosa. Besides the installation in the gallery’s main room and the participation of Depois do Fim da Arte, Longo Bahia is presenting two new series of works and an intervention on Galeria Vermelho’s facade. The artist selected paintings from different moments of her career to be covered with the same gray paint that the city government has been using to cover the urban art around the city of São Paulo. Six paintings will receive a layer of concrete-gray paint, preventing the appreciation of the works that formerly occupied the canvases. For Olimpiadas [a play on the words Olympics and gag] Longo Bahia collected newspapers from the time of the Olympics in Brazil and painted the image of a clown on each front page. There are 48 paintings, made on the front pages of three different newspapers from 16 consecutive days of journalistic coverage concerning the event. On the first pages of these newspapers one can note a clashing between the coverage of the Olympics and of the Brazilian political crisis. Longo Bahia weaves a commentary in regard to the ironic humor, seen by many as a bad joke, of hosting an event of the size and cost of the Olympics – which, in a certain way, is also concerned with global and mass entertainment – during one of the biggest political crises in the country’s history. 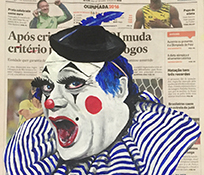 On Galeria Vermelho’s façade, Longo Bahia made a large painting whose background is the same gray paint used in the paintings, with one of the clowns of Olimpiadas applied over it. The intervention gains yet another layer of reading when we recall that the gallery’s 105-square-meter façade has already held more than 90 interventions by different artists. ainda não [not yet] is a proposal for occupying the space of Galeria Vermelho by the research group Depois do Fim da Arte, made up of artists, researchers and students of visual arts and cinema, oriented by Dora Longo Bahia and Renata Pedrosa. The group proposes to construct a space for the production of artworks, which through debate and the practice of art will reflect on the place of art in the current political, social and historical juncture. This proposal aims to be a place for temporary actions, whose development will take place over time and in an open space, allowing the public to see the hits and misses of the group’s proposals, while also exercising a collaborative work logic. With: Andrés Suárez, Bruno Ferreira, Bruno Storni, Celso Nino, Felipe Salem, Francisco Miguez, Frederico Ravióli, Ilê Sartuzi, Isabella Rjeille, João Gonçalves, Lahayda Dreger, Marina D’Império, Pedro Andrada, Renato Maretti, Talita Hoffmann, Tomas Irici and Victor Maia. For the occupation of Dora Longo Bahia’s study group, Vermelho counts once again with the support of Epson. The partnership between the two companies has materialized a few times in the gallery, as in the exhibition Um, Nenhum, Muitos (One, None, Many), by Carmela Gross and in the Sala Antonio – Vermelho’s cinema – which features Epson projection technology. Epson, known worldwide for the quality of its photo printers, presents some of its professional image solutions at Vermelho: SureColor® P800 and P7000 printers, which offer excellent performance and professional print quality. The SureColor® P800, a 17-inch printer, features an optional 43cm paper roll adapter, ideal for paintings and prints in widescreen up to 3 meters. Along with the nine cartridges, this model is designed for professional use at home or in the studio. The SureColor P7000, 24-inch, includes a set of 10-color UltraChrome® HD inks, ideal for graphic designers, photographers, resproduction works and fine art. Finally, the Perfection V800 Photo scanner, with a resolution of 4800 x 6400 dpi ensures accurate color and sharp detail when scanning photos, negatives, and slides for files or for playback. A dupla Gisela Motta e Leandro Lima ocupa a Sala Antonio, o cinema da Vermelho, com Psicose, recriação do clássico de Alfred Hitchcock a partir de imagens e sons adquiridos em diversos bancos de “royalty free media”. Todo o material do filme original foi substituído, criando uma nova obra que mantém o original reconhecível. Além de levantar questões a respeito da originalidade, Psicose articula questões relativas à construção e articulação simbólica. Ao expor a pesquisa por imagens para a edição do filme em um canal secundário localizado na entrada da sala de projeção, Motta e Lima evidenciam como a montagem e a continuidade constroem sentidos. A pesquisa por uma imagem de um chuveiro ou de um letreiro de motel isoladamente podem não trazer aspectos conectados ao filme de Alfred Hitchcock, porém a montagem tece uma relação entre as partes, corporificando um todo reconhecível. Projeto contemplado pelo programa Rumos Itaú Cultural 2013/2014.